iLoveToCreate Blog: A peek inside our crafty world! A peek inside our crafty world! People have often referred to our company as "the Willy Wonka Factory of Crafts", so we wanted to give you a little glimpse into our crafty world. There are a lot of products from paints to glues to bottles of glitter that we use on a daily basis, so we have to be well-stocked to meet a last minute rush project! Of course, like other crafty places, we sometimes make the occasional craft store run. Even with our many supplies, sometimes we still can't seem to find a white piece of felt or the exact pink ribbon we need! But as far as our own products go, we usually have plenty to choose from. 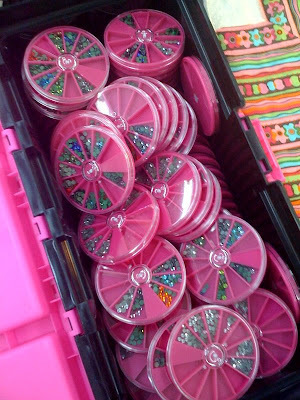 Case in point, check out this stash of Tulip® Glam-it-Up Iron-On Crystals™ that I noticed today at Cheryl Ball's craft desk! I asked Cheryl why she had so many and she said, "Well, there's always one color we seem to be out of, so we have all of these on hand." So in our craft decorating department, it's crystals that are a girl's best friend! Check out this cool technique! We show how to apply our crystals here! Awesome! I want to see more pictures! More, please! !